Whether you need to sub-divide an office meeting room, school or nursery classroom, church hall or drama studio it is apparent that having flexibility of space is an increasingly important commodity in many modern day working environments. Variwall Partitions Limited was incorporated to service these needs by specialising in the supply and installation of various types of efficient and flexible internal partitions. We offer a range of folding partitions which are suitable for either small or large projects and budgets. Our products are available in many different finishes and can be manufactured to achieve various acoustic performance levels. The bespoke nature of our work also gives us the flexibility to adapt to our clients needs to ensure each specification is met. Being based in the Midlands means that we are conveniently located to work on projects throughout the UK and with extensive industry experience we are well suited to offer a knowledgeable and efficient service from initial quotation, to design and technical support, right through to installation. Each of our products is manufactured here in the UK, thus reducing transport costs and continuing to support high quality British manufacturing. 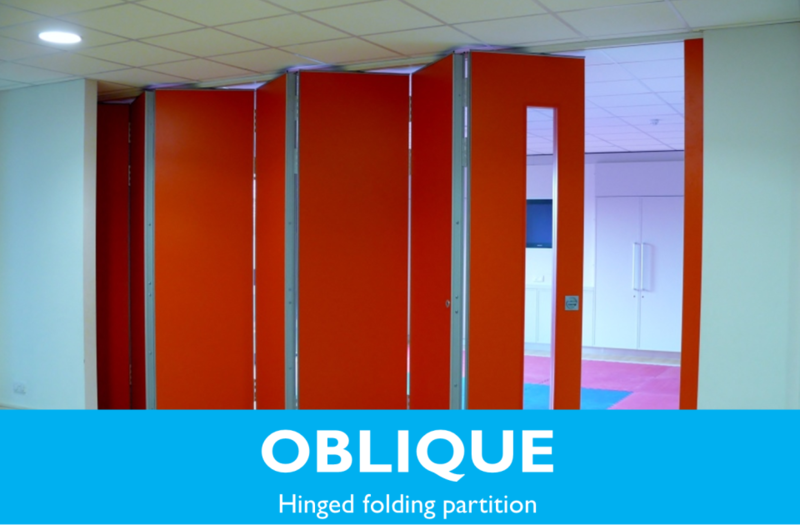 With every product being entirely bespoke, the range of folding partitions you will see on this website can be manufactured to suit the needs of your particular project. With a plethora of acoustic performance ratings, surface finishes and stacking options we can tailor our partitions to your requirements. Acoustic operable walls are our Premier system. 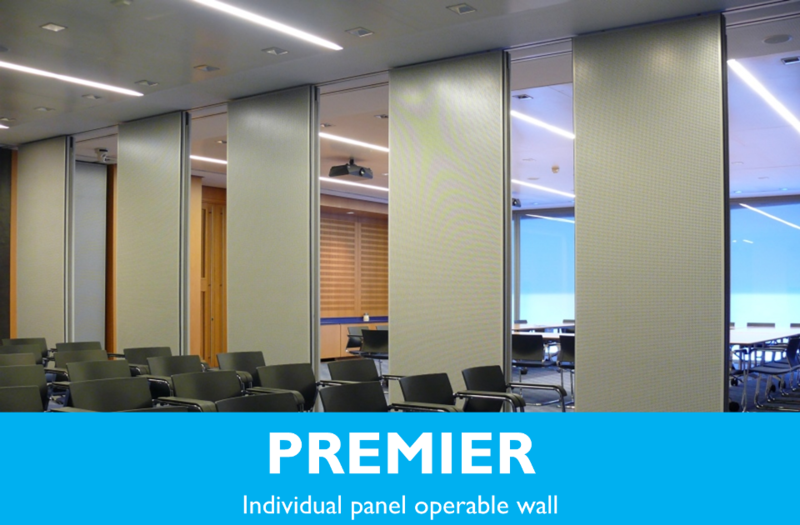 These individual panel movable walls are able to achieve an acoustic reduction of 57dB which makes them suitable for drama studios, universities, hotels and meeting rooms. Our moving walls can create a great deal of flexibility thanks to their many stacking options, high acoustic performance and being able to achieve heights of up to 10 metres. We supply a hinged sliding folding system which is ideal for a wide array of applications such as offices, community centres and schools. 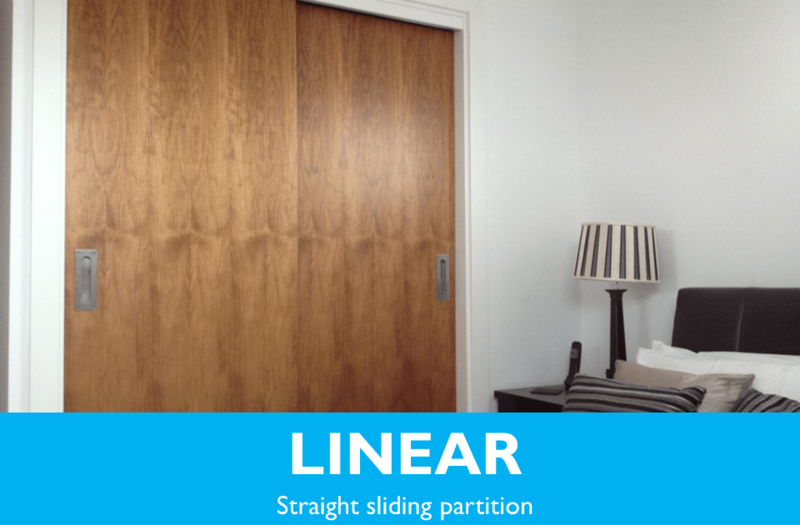 These folding partitions can provide a good acoustic performance rating to ensure privacy either side of the partition. 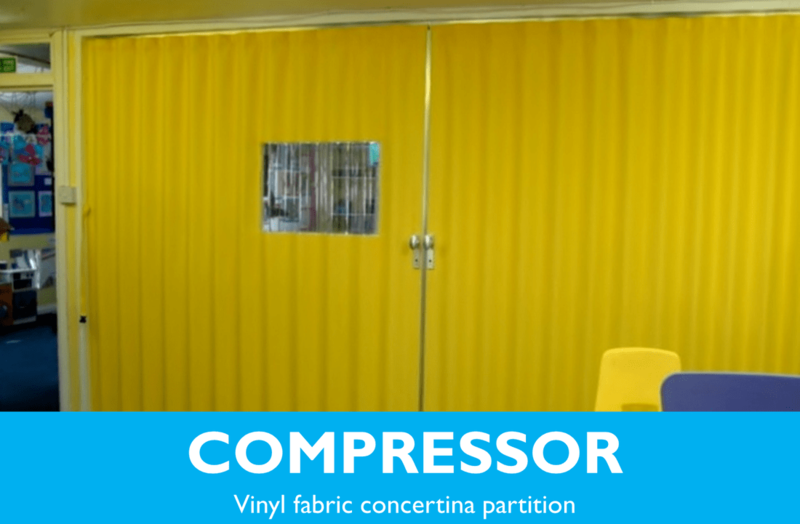 Our fabric concertina partitions are perfect for primary schools, nurseries and church halls as they are lightweight, easy to operate and can be wiped clean in the event of any possible spillage or marking. These accordian partitions offer a cost effective solution and can be installed relatively quickly and hassle free. In addition to our range of flexible room dividers, we also offer a service and maintenance package on new or existing folding partitions. For health and safety reasons, it is recommended that movable walls are serviced on a regular basis to ensure they are functioning properly and safely.